Having reference marks on your bottom panel helps keep everything perfectly symmetrical later and they are very simple to add when your panel has nice straight edges. The marks you are adding will all be inside your completed board so you don’t have to worry about them showing. 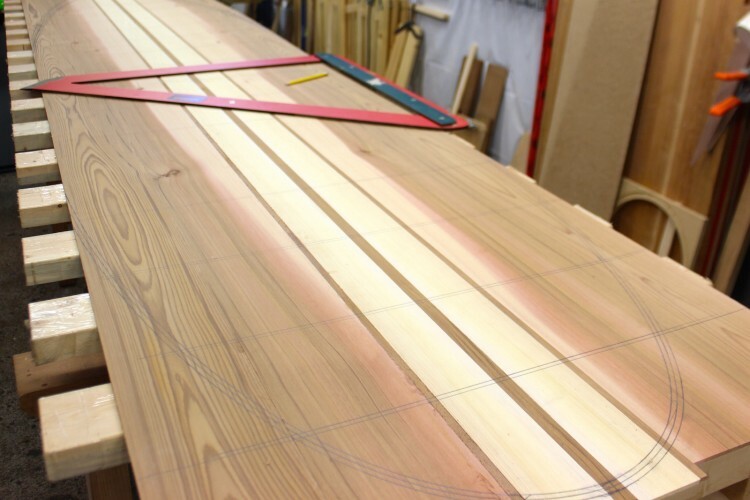 The marks by the nose and tail are used as a reference point when you trim your rails for solid blocking. They will help ensure your blocking is symmetrical from side to side. The square marks for the ribs come in handy as a guide for applying the adhesive as well as providing a reference for aligning the ribs. The outline template is used to draw a perimeter mark for trimming the panel to size. I usually draw a couple of extra marks at 1/4 & 1/2″ larger than the outline template as the outline mark will be covered by to nose and tail blocking. I use hardboard templates so adding the extra marks is very easy by putting your pencil in a washer and drawing a perfect offset. If you are using a paper template I would just add a couple of pencil marks in the nose and tail areas and not worry about going all the way around the template as shown. Note: The outline template represents the widest part of the rail and not the starting point for the first rail strip. The outline marks you are drawing are for reference use only! The outline of the board. Square reference marks for nose and tail blocking. Square reference marks for each rib. Step 1 – Trace your outline template. Step 2 – Use a square to mark 6″,7″ & 8″ from the nose. Step 3 – Use a square to mark 3″, 4″, & 5″ from the tail. 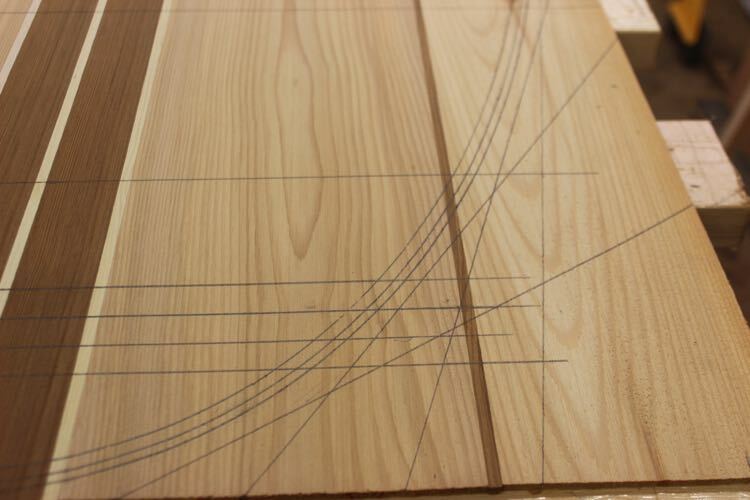 Step 4 – Draw square lines at the rib locations. 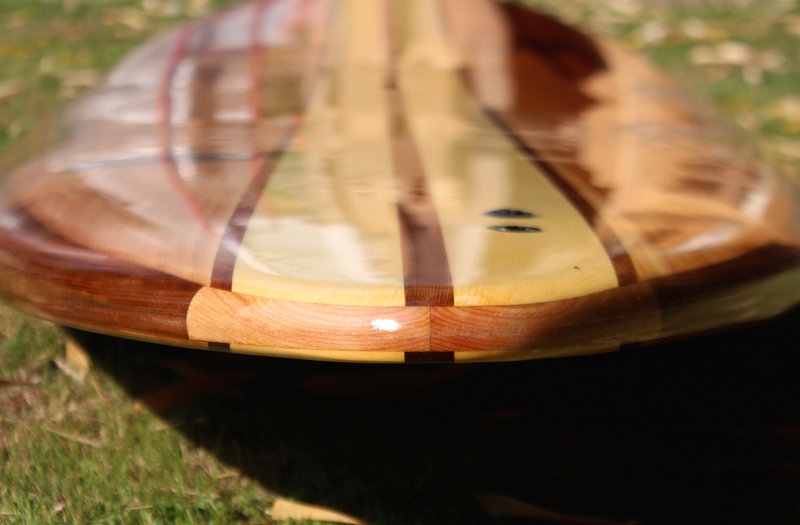 Tip: I use the centre spine of the fishbone frame to locate the exact location of the ribs. Having a friend assist you with this process is helpful, as you really need three hands. Arc the bottom curved of the fishbone along the centerline and mark the notches with a pencil. After you have these marks you can draw nice square lines. Tip: Try not to align nose and tail blocking to the decking features. If your lines are never closer than the width of a pencil it is really hard to tell if they are not quite perfect. Without any visual reference points perfection is much easier to achieve!